You need to be a member of Food! to add comments! I've always used a potato masher for that sort of thing. I do the same thing with pears, & a little cinnamon for pancake ''syrup''. Oh! Goodness, that sounds delicious, and an easy way to make applesauce with little chance of scorching. Daniel, your red cabbage kraut and fig jam look vibrant and I salivate just looking at them. Oh! I hope I didn't make the deer sick; your comment gives me some relief, Ruth. I will sow more seeds of clover, turnips, and alfalfa, which I have already strewn in the meadow. Maybe deer can eat the fruit, but not tomato plants. Today I saw two deer eating fallen wild crabapples right off the edge of the road. I slowed down to scare them less, but the traffic was fairly heavy and they left soon. I also wondered about them getting a tommy ache from the crabapples. I will post this in food because the deer had a feast. I threw the orange tomatoes into the meadow because they had skins like a rubber balloon and tasted about as good. There was about a bushel of them. The deer came by this morning and ate them as if they were candy. Some of them were huge; the deer picked them up in their mouths, smashed the fruit, and juice flew everywhere. The deer ate the pieces that flew and then used their lovely long tongues and cleaned out their noses. I hope I didn't make them sick! I know I can't let them eat potatoes, but I think, hope, begged nature that I did not make them have a tummy ache. "Deer resistant vegetables in the nightshade family include tomatoes and tomatillos, potatoes, eggplant, and some peppers. Other plants toxic to deer: Rhubarb and cucumber leaf are toxic to deer. Many otherwise toxic plants do not harm deer because they are ruminants." ~ can deer eat tomatoes? Loam, have you used the fermentation devices such as this? Do you have pros and cons that you can offer? 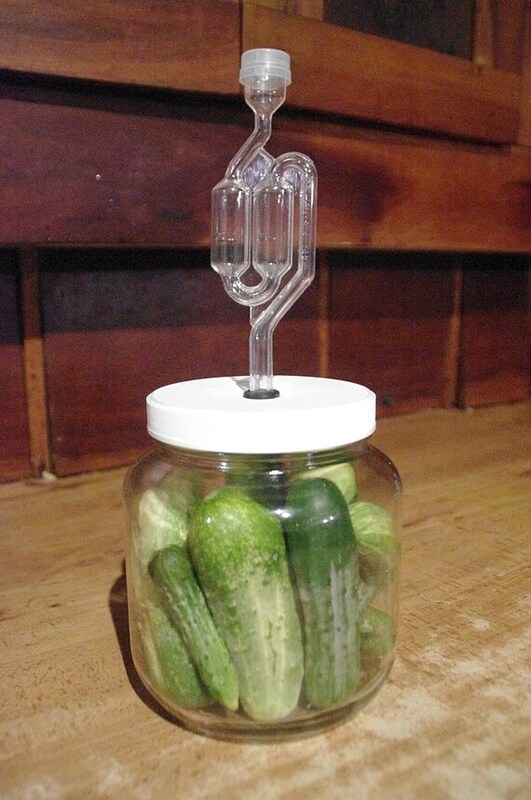 How do the pickles and other fermented vegetables compare when using this device? After reading a couple of "food and recipe" books, I bought several things at Aldi that I have never tried before: chia seeds, organic tofu, and ghee among them. I also got some blue cheese stuffed olives. Not sure how I'll use them, but I couldn't resist trying something new. They're supposed to be good for us.